At Memories Chapel, our funeral directors have the knowledge and experience to help families understand the options available to them, explain the value of different product features and to help create highly personalized, meaningful tributes. They’ve been trained to help families through the grief process and can do so in an environment that is conducive to healing. We endeavour to offer excellent service and discuss the many choices that may be of importance to you. We will take the time to listen to your needs and do our very best to have those needs met. There are many ways to bring a very personal touch to a service and thereby reflect the life of your loved one in a very meaningful and powerful way. Below are some suggestions you may want to consider in a tribute to your loved one. A final tribute spoken in memory of a person who has died usually delivered by a family member, friend, or clergy. It can include a recollection of events of a person’s life, the impact that a deceased person has left and the legacy left behind, as well as humourous stories or remembrances. Throughout our lives music has a way of making memories even more memorable. Music is an important part of many social rituals and can help bring a healing touch to any ceremony; many times where a spoken word might fall short in comforting someone, music succeeds. Many artists have written songs that portray the life lived, the life lost, and the life remembered. Memories Chapel can arrange live singers, musicians or recorded music to add a meaningful touch to your loved one's service. Including flowers can add significantly to the ceremony. The number, colour and placement of flowers can all carry special meaning. A favourite or special flower, seeds or bulbs can be given out following a service or gathering, offering a remembrance of the deceased, once the flowers bloom. Memories Chapel can produce a professional quality tribute video commemorating the life of your loved one. A compilation of photos that depict a person’s life, family, interests and career can be set to meaningful musical selections and shown during the funeral service or memorial gathering. A personalized DVD and case is presented once completed. Read by a family member or friend, these may be readings from religious scripture or from other inspirational sources such as a passage or poem, written or cherished by the deceased or which reflects upon their unique life and philosophies. It is completely appropriate to inject humor if it is a true reflection of your loved one. 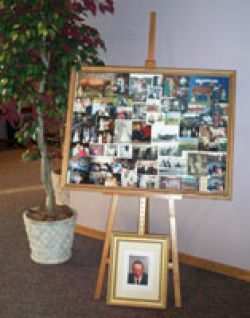 The Memory Board can be displayed at the viewing, funeral service or reception. Memory Boards are a collection of pictures that are placed on a matte board. The board can be filled with photos of the loved one as well as quotes or verses, letters, badges, cards or any other flat material which is attached to the board. The mat board is then placed in an oak frame and mounted on an easel. Balloons can be released at the end of the service or graveside to bring closure to the ceremony. Family and friends may find that having a balloon release tribute at the finale of a service is something that offers them the ability to remember their loved one. It is a tangible way to allow people of all ages to say their final good bye.Balloons being released into the air make a unique ending to a ceremony and may help to provide a sense of closure to individuals as they let go of their own balloon. Bagpipes have long been associated with funeral ceremonies. Hearing "Amazing Grace" on the bagpipes at the graveside service can be a very moving experience. The bagpiper can be used to lead the casket in or out of a church or our chapel, or commence or conclude a ceremony at any location. "Thru Dedication and Service to a Grateful Nation" A bugler or trumpeter is often seen and heard at a service for a veteran. "TAPS" is most appropriate with a bugler present at the cemetery or ceremony. Other selections can also be arranged. Many people find comfort and meaning in bein g able to view the service again or to offer to family or friends that may not have been able to attend. Services can be recorded either in our chapel or other facility to capture those special moments or meaningful words.The family will receive this recording on a personalized DVD and case.